Icing Simulation System « Appealing Products, Inc.
Video – View a demonstration of the anti-icing nano-layer. 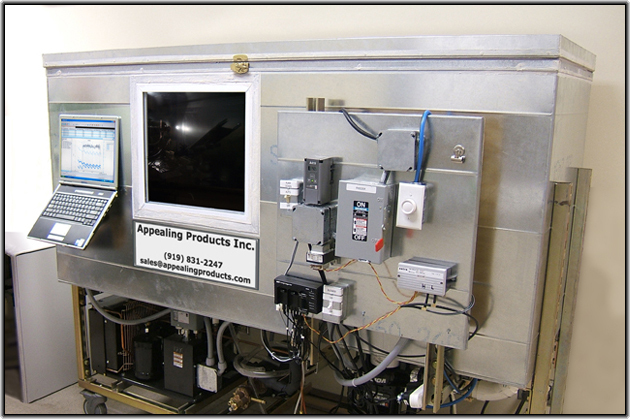 Appealing Products Inc. has developed the Surface Icing Simulation System to determine the effects of water and ice on surfaces at high speeds. The SES allows for surfaces to be tested under harsh but controlled conditions, allowing for the determination of surface properties such as stability. The Surface Icing Simulation System can bombard any flat surface up to 6″ by 6″ in dimension, and segments of wing models 6″ wide and up to 21″ in length. For determination of surface stability in rain conditions, the machine can be ran at ambient temperature, delivering water to the surface at up to 150 miles per hour, and up to 6.0 grams per cubic meter water content. 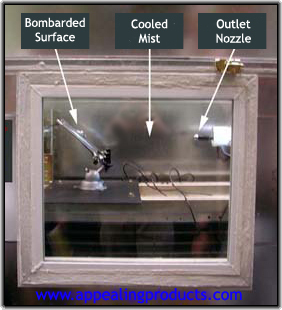 Icing conditions can also be created for surface testing. The system can reach a nominal temperature of -20F, with stabilized lows at -5F. At ambient and low temps, droplets range from 12-50 microns.